A pretty vegetable combination for a super supper. The smoky flavor of the grill is created by the grilled chicken and grilled sweet corn in the salad, which is then mixed with grilled onion dressing. Use our tips in Grilling for all your grilling needs. Season chicken breasts on both sides with salt, pepper and a drizzle of olive oil. Grill 4-5 minutes on each side or until cooked through. Set aside and allow to cool and then cut into bite sized pieces. Halve, pit, peel, and cut avocado into 1/2" pieces. Sprinkle with lemon juice so that the avocados do not brown. In a large salad bowl, toss together romaine, corn, watercress or spinach. Add chicken, ham, tomatoes, eggs, and avocado. Pour as much grilled onion blue cheese dressing over salad as needed (you may not need to use entire batch). Toss well. 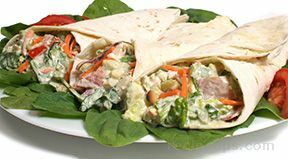 Divide over tortillas and fold or roll up to make a sandwich wrap. Peel onion. Place whole onion on a square of aluminum foil. Pour olive oil over the onion and salt and pepper to taste. Seal the foil and grill onion over medium heat for approximately 30 minutes. Check occasionally. Allow the oninon to cool and then dice.